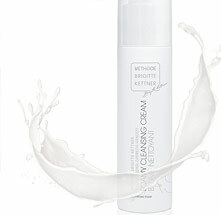 Methode Brigitte Kettner offers an extensive array of cleansing products. The cleansing milk is an efficient make-up remover (face and eyes), even for people with sensitive skin. The innovative care formula supplies the skin with the moisture it needs and stabilises its protective acid mantle. Using the cleansing lotion perfectly formulated for your skin type refreshes and invigorates the skin. It provides the optimal basis for absorbing the active ingredients in the care products you subsequently use.